Dagens DC: Fake News, Real Impact? Dagens DC har vært så heldig å få en eminent gjeste-blogger fra University of Virginia til å fortelle om hennes syn på Obamas første besøk på Jon Stewarts Daily Show onsdag kveld. Værsågod! President Obama appeared on the “Daily Show” last night – his first as president – in a last-minute effort to rally Democratic fortunes before the midterm congressional elections. Obama has made a habit of presidential “firsts” in the television stakes – appearing on a variety of daytime and late-night talk shows since taking office. But his choice of venue this time was intriguing, saying much about the force that “The Daily Show” – ostensibly a fake news comedy show – has become. Its host, Jon Stewart, and his progeny, Stephen Colbert, have made names for themselves parodying American newscasters – with Stewart the “serious” anchor with a leftist bent, and Colbert the larger-than-life conservative commentator. But in doing so, they have become political players in their own right. 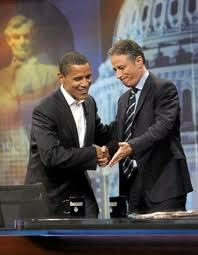 When Obama told Stewart, “I don’t want to lump you in with a lot of other pundits” – his legitimacy was clear. The fake becomes even more real this weekend, when Stewart and Colbert will stage dual political rallies in Washington, D.C. The rallies “to Restore Sanity and/or Fear” are expected to draw big crowds – big crowds of a particular sort, that is. The Daily Show’s young, mostly left-leaning audience is exactly the demographic Democrats are targeting this election – fearful that the young voters who turned out in droves to put Obama over the top in ’08, will instead choose to stay home this time. So real has the Daily Show become then, that Democratic-aligned groups are trying to hop onto the Comedy Central train by helping to promote the event and busing people in. So this is the point. Obama’s Daily Show appearance was designed to put the president front and center among those potential voters, to remind them of what 2008 was about, and to implore them to stick with it and support his Democratic colleagues in the Congress. But did he do it? Obama’s appearance itself was notable for his subdued demeanor, possibly reflecting an effort to appear “presidential” amid the atypical surroundings. Candidates usually appear on these kinds of shows to demonstrate their “realness” – that they are a “regular guy,” that they can have fun, they are “someone you can have a beer with.” But expectations around what is appropriate for a president are different, and Obama seemed uncertain of how to play it. Nor is the Daily Show necessarily a fluff interview. A key to its success is that, through humor, Stewart gets away with hard-hitting questions – pressing Obama on his achievements and the status of “hope and change,” and noting the number of Democrats running away from any association with him. For his part, Obama made the case for his accomplishments over the last 18 months, saying that “we’ve done an awful lot of what we talked about during the campaign.” But he appeared frustrated at times. Responding to Stewart’s suggestion that legislatively, Obama’s program “has felt timid at times,” he exhibited the same kind of criticism of the left as in his recent Rolling Stone interview – noting with some exasperation that they focus on the 10% of that wasn’t in the healthcare bill, not the 90% of what they wanted that they got. Obama sometimes seems surprised he even has to make this case – commenting on this legislative session he noted that, from a historical perspective, “it ranks up there with any in history.” The record speaks for itself, he seemed to suggest – why should he have to say more? Perhaps because, as he also admitted, “we’ve done stuff that some folks don’t even know about.” And that is part of the problem. For a candidate lauded for his oratorical prowess, Obama’s failure to communicate his message in office has been surprising. The simple message he offered as a candidate – “change you can believe in” – has also been challenged by the realities of governing. “When we promised, during the campaign ‘change you can believe in,’” Obama tried to explain, “it wasn’t change you can believe in in 18 months.” But is that a message he can sell? Is that really what the voters signed up for in 2008? “If we are making progress, step by step, inch by inch, day by day, then we’re being true to the spirit of that campaign,” he said. Not the most thrilling of prospects for the average young person. The problem with “wave elections,” such as Obama benefited from in 2008, is that expectations are so high – it’s always difficult to meet them. And that’s something that many Republican candidates may well face next time around, if, as widely expected, many of them are swept into office on Tuesday. Obama’s rhetoric, however, fueled those expectations beyond normal measure, and it has come back to haunt him. Obama tried to deny Stewart’s suggestions that “Yes we can” had become “Yes we can…given certain conditions,” but when restating his message, he tripped up – it’s “Yes we can, but…” he trailed off. “It’s not going to happen overnight” he added, “and we’re going to have to work for it.” But that was a big “but”. So if this was an effort to fire up the young base, he may have missed the mark. Though perhaps Stewart and Colbert can make up for that this weekend. Given what’s at stake, it’s not surprising that Democrats would welcome this support, but for a White House that made a point of criticizing the conservative-leaning Fox News Channel and its apparent promotion of the “tea party” movement, Obama’s promotion of the event is surprising. Somehow, it is acceptable for “fake news” to promote a political cause, where “real” news cannot. Or is it that, in this case, it will be promoting his political cause? Obama ended his appearance with a non-partisan “plug” asking viewers “just to vote” – but he could be pretty sure of who he was encouraging to do so, and ultimately, that’s why he was there. In an election characterized by a serious “enthusiasm gap,” can comedy close it? On Tuesday, we should find out. Emily Jane Charnock, October 28, 2010. Well, "Colbert the larger-than-life conservative commentator" I would not exactly call Colbert Conservative. He is a full-blooded liberal. Eg his democrat friendly Congress testimony on immigration current and hard evidence that he is left wing friendly.